Hulsie Bhaggan (centre), clinical director, New Life Ministries Rehabilitation Centre, shares her experiences during a panel discussion hosted by Shell to commemorate International Women’s Day. To her right is panel participant Lisa Wickham, film producer and acting CEO,TTT. “Some of the most vulnerable women in our society are those who are battling addiction and for one reason or another are unable or willing to access our rehabilitation programme,” said Hulsie Bhaggan. 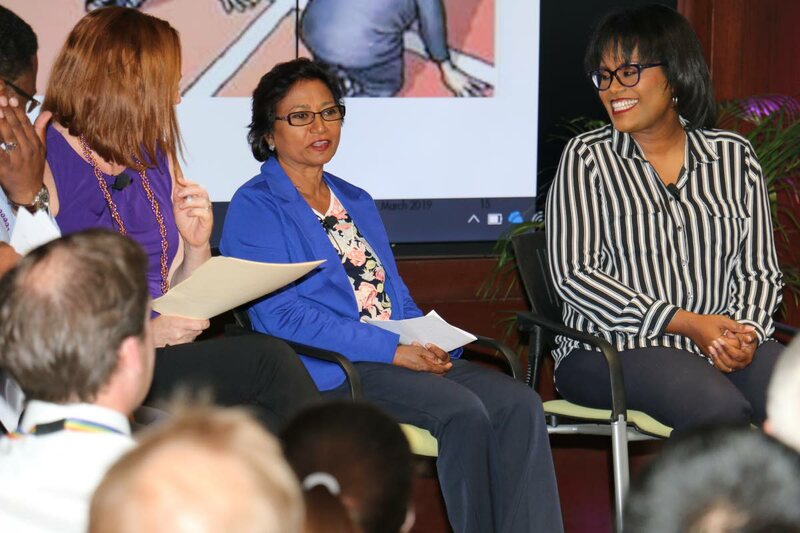 Bhaggan, clinical director of New Life Ministries Rehabilitation Centre, was speaking during a panel discussion recently, hosted by Shell Trinidad and Tobago Limited to commemorate International Women’s Day (March 8). More men are seeking help in her programme than women, she said, which was concerning, but the women who do come are more motivated to stay clean. She said more needed to be done to encourage the women in vulnerable situations to get help. Bhaggan was joined on the panel by acting CEO of Trinidad and Tobago Television Lisa Wickham, and Shell employees; Eugene Okpere, chief operating officer, Kelly De Bique, operations manager, Lana Cordy, engineer and interventions team lead, and Petula Gunness, maintenance, reliability and turnaround manager. In addition to discussing the challenges of women who are at risk in the community, the panel also discussed the experiences of women in business and the corporate sector. Shell human resources manager Stacey Patel-Kissoon said while the company was making significant strides in achieving gender balance and work/life balance for all employees, continuing the conversation was critical. During the panel discussion, Bhaggan, a former MP for Chaguanas, said growing up in a household with brothers, she never felt limited in what she was “supposed to do” as a girl. Women, she said, should never have to apologise for their choices, whether they want a family or not. She referenced her own decision to opt for a life of service, and said she was quite fulfilled. Wickham, who has spent most of her life in the public glare as a television presenter and film producer, and now at the helm of TTT, expressed surprise that even with the strides women have made in business and in the corporate sector, not enough companies were creating safe spaces for women to work while caring for their children. Speaking to a diverse audience of male and female Shell employees, Wickham challenged younger women to think more deliberately about the kinds of companies they want to work for. Seek out those companies that appreciate the multiple responsibilities and roles that women play and are willing to support their development, she said. 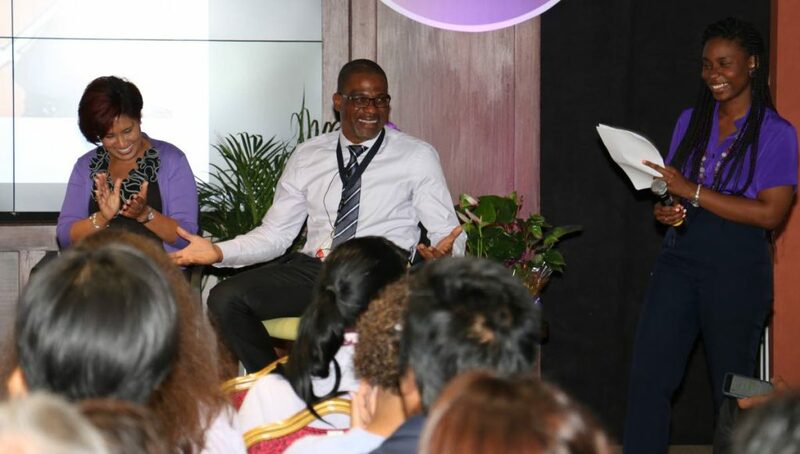 Eugene Okpere, chief operating officer, Shell Trinidad and Tobago Limited makes a point during the panel discussion in recognition of International Women’s Day. The panel discussed a range of gender issues including the experience of women in the workplace. At left is Petula Gunness, manager, Maintenance, Reliability and Turnaround at Shell who also spoke on the panel; and at right is Gabrielle Dempster. The Shell employees on the panel shared their experiences of striving for balance in their own careers, where they encountered challenges and where they have received support. “Early in my career a manager told me. ‘I don’t think women should be engineers.’ I had just got on the rig and in my mind, I was like. ‘Well. I’m here. so you have to deal with me.’ But the truth is as a young professional that’s difficult to deal with,” recalled Cordy. The environment has greatly changed now, Cordy said, but there is work still to do to change those persisting mindsets and assumptions about the roles of men and women in the workplace. Shell VP and country chair Derek Hudson also reminded the audience that while progress has been made it was as recent as 2010 that a female employee was told she couldn’t stay offshore overnight because there was no accommodation for women. “That was not even a policy of the company, but simply one person’s assumption of what should obtain. These are the assumptions that we have to work on,” he said. Shell operations manager Kelly De Bique, who has been in the business for more than 12 years, shared his own experience with bias. “My name is Kelly, which people assume is a woman’s name. I remember being just out of university and applying for jobs in the sector and receiving about 15 rejection letters. Some of them even replied to me as ‘Miss Kelly De Bique.’ It was only when I sent out applications again and made sure to indicate I was Mr De Bique, the very first one I sent out, I got an interview. That shocked me,” he said. De Bique acknowledged that TT was a much more liberal society in terms of the roles of women and men in the workplace, as compared to some other countries where he had worked. Each of the speakers encouraged the women in the room to not be daunted by the stereotypes they might encounter and called on the audience to challenge their own inherent gender biases. The IWD panel discussion was hosted by Shell’s Balanced Network team, a diverse group of Shell employees who promote employee engagement and development activities across the organisation during the year. Reply to "Women (and men) smash stereotypes"